We are back from our little summer break at the beach. The Princess and I are still supposed to be there but we came home a few days earlier because of some appointments I had forgotten about! But not to worry because it is raining anyway!!! Its a good time to do a bit of catching up, like do the draw for my December give away. 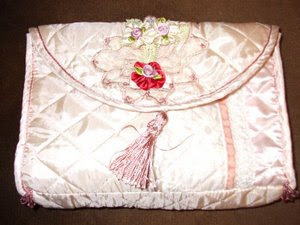 The winner of this gorgeous, if I do say so myself, oyster pink quilted satin bag is . . . The lovely Barbara Burkard of 123 Lavender Lollipop Lane. Yahee for Barb!!! If you haven't visited Barb best you do, she is another incredibly talented lady in the land of Bloglandia. I wasn't the only one who was late doing their December draw. So was Ms Karla Nathan of Karla's Cottage. She also did hers today and GUESS WHAT????? It's me, I'm Karla's winner. Yahee for me!!!! 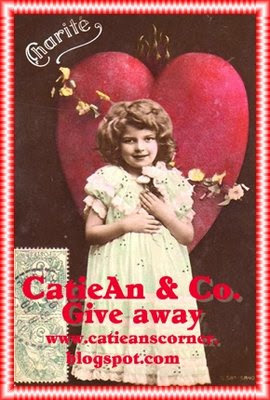 Speaking of give aways, Catie at Catieans Corner is having a give away to celebrate her birthday and her 75th post. Go visit Catie and enter her give away. She's a lovely lady and super generous, I can vouch for that as I have been on the receiving end of her generosity in a previous swap. Happy belated birthday wishes dear Catie. 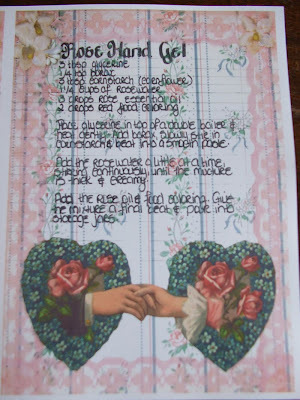 The only crafting I have done since Christmas is my recipe for Karla and Beth's Sweet Treats Swap. Here is my copy, a few embellishments tonight and its good to go (in the post)! The beach was great, sun, surf and sand not to mention yummy food, wine and good company! We hardly saw The Princess, two big girls live in the front house of the beach section and she spent the entire time with them. 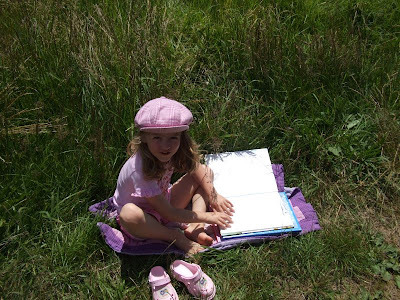 However, every Princess needs a little time out for quiet reading! We were off to visit a gypsy fair (sorry forgot to take photo's of it!). The Princess is showing off her new lip gloss! 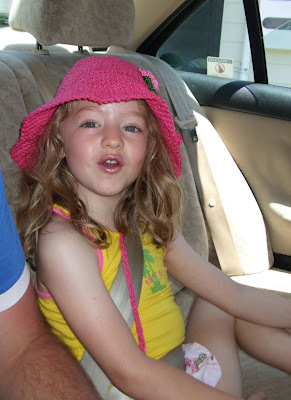 At 4 years old!!!!! 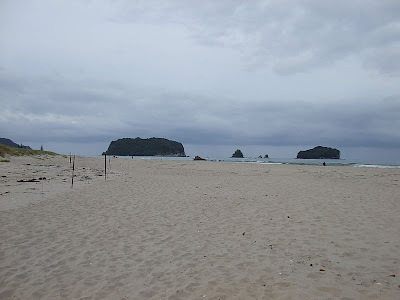 We walked down to the beach everyday, the water is so warm. Good surf too so we would take the Body Boards down. So much fun. 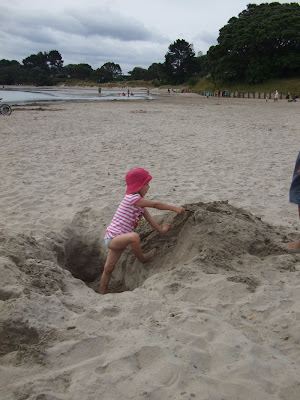 The estuary is a nice safe place for wee ones to swim and play, build sand castles, collect shells and dig to China as someone tried to do here in this huge hole The Princess found. 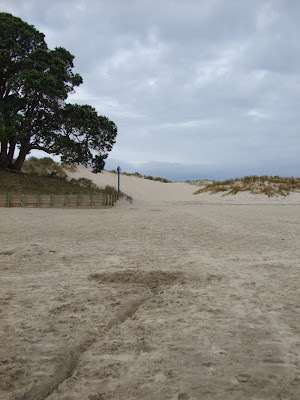 The only day I remembered to take the camera down to the beach and it was overcast! This was taken at about 6.30pm, during the day it was jam packed with people. I wanted to share with you the beautiful soft golden sand we have on most of our East Coast beaches. 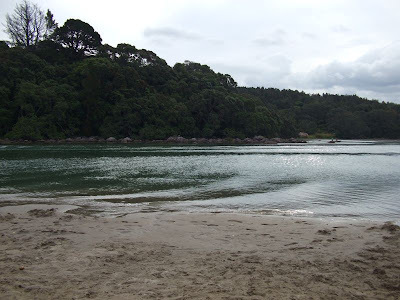 This is the main beach looking out to rocks and Islands, when the sun is shining it is glorious. Another reason we came home earlier was on New Years Day, Babes fell of the back of a jet ski and lost his only pair of prescription glasses that we had all told him to take off! He spent the rest of the holiday in a long distance blur! 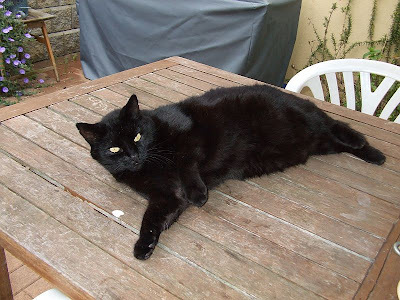 Coco our cat was really happy to see us home, for all of 5 minutes before she returned to her normal feral state! 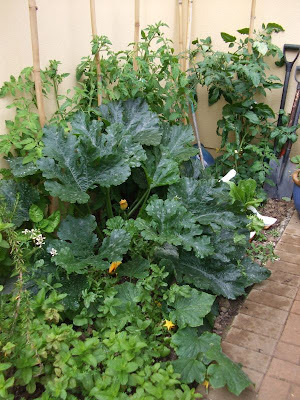 My salad garden that Mum diligently watered for me has run wild! I made the mistake of planting a zucchini in a small space!!! My rocket, coriander and basil are all going to seed in the heat and then rain. I adore roses but I also love lavender. 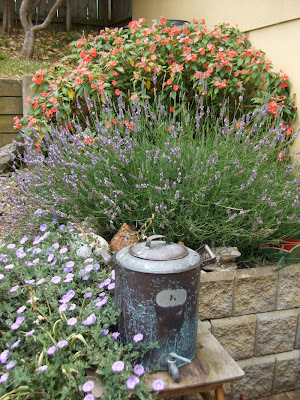 I thought I would share one of my lavender's with you. 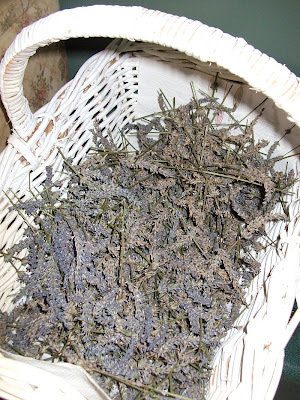 Each year I harvest the crop, the corner of my living room where this basket of drying lavender sits smells divine. 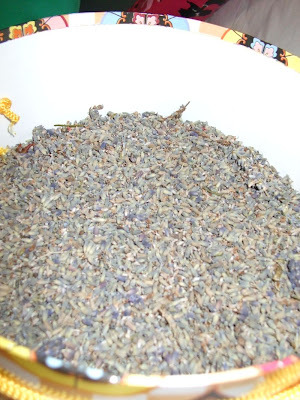 Once its dry I de-seed it and use it for my lavender hearts and other crafts. Gorgeous! Did any of you make New Year's resolutions?? Mum and I don't so much as make resolutions but list our objectives for the year. Maybe at the end of each month I will post an evaluation of my progress, now that might be a good motivator. Oh, start commenting for my January Give Away, I'll post a photo of the prize sometime this week! p.s. I had 200+ blog updates on my Google Reader when I got back from holiday. I have visited all of you and left comments on very few otherwise I would still be here next January catching up!! !